November 19th 1969; Brazilian soccer great Pele scores his 1,000th professional goal in a game, against Vasco da Gama in Rio de Janeiro's Maracana stadium. It was a major milestone in an illustrious career that included three World Cup championships. Pele was blessed with speed, balance, control, power, and an uncanny ability to anticipate the movements of his opponents and teammates. Although just five feet eight inches tall, he was a giant on the field, leading Santos to three national club championships, two South American championships, and the world club title in 1963. Under Pele's leadership, Brazil won the World Cup in 1958, 1962, and 1970. In 1970, Brazil was granted permanent possession of the World Cup's Jules Rimet Trophy as a tribute to its dominance. 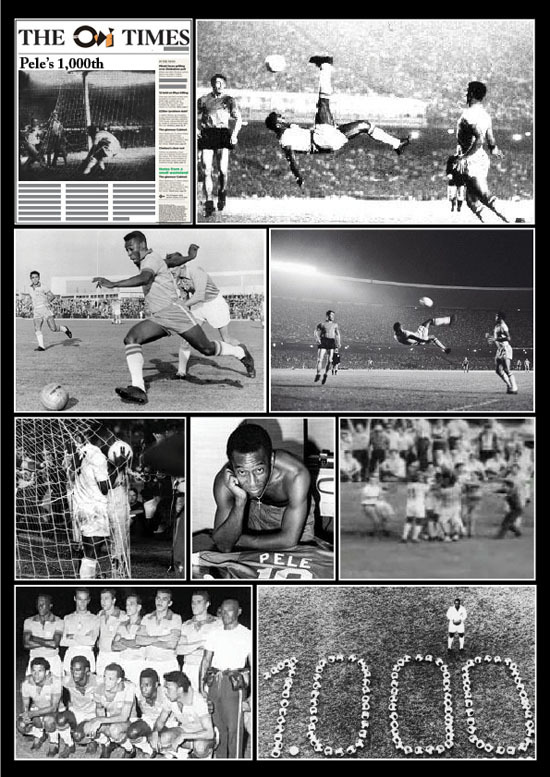 On November 19, 1969, Pele scored his 1,000th goal on a penalty kick against Vasco da Gama. Eighty thousand adoring fans in Maracana stadium cheered him wildly, even though Santos was the opposing team.